A typical warehouse forklift weighs an average of 9,000 pounds and can be very dangerous if left in the hands of an untrained operator without the right safety tools. 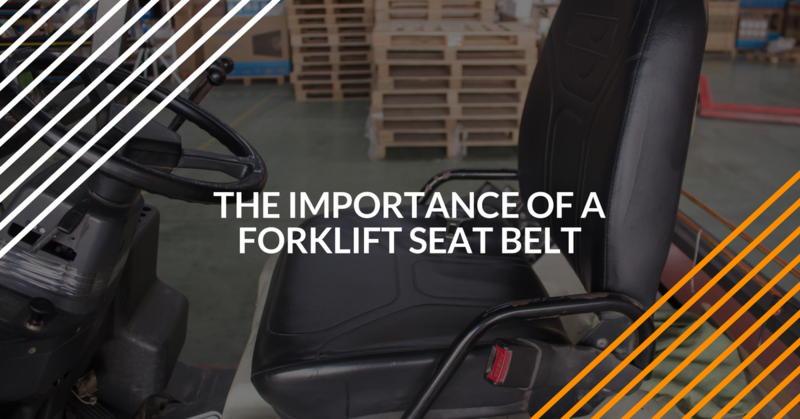 There are roughly 85 forklift fatalities a year, and seat belts play an important role in preventing more from happening. If you operate forklifts, you must receive proper training and utilize all of the safety tools at all times to minimize your risk of injury or fatality when driving a forklift. Our OSHA forklift training reviews important safety measures you need to know to operate a forklift – including seat belt use. Forklift seat belts are required by OSHA regulations. Think about it – you’d never drive a car with known hazards ahead on the open road. It’s not only dangerous – it’s also against the law! If you drive a forklift, you should be aware of forklift seat belt law from OSHA. Case in point: let’s say you’re involved in an accident while not wearing a seat belt. You’re not injured (thankfully), but an investigation report is filed, and OSHA representative visits your facility to conduct an investigation. If it is determined you weren’t wearing a seat belt, OSHA can hit your company with severe fines and penalties. You don’t need the extra safety hazards. And your company certainly doesn’t need the negative publicity. Bottom line: always use your forklift seat belt! Forklift tip-overs are the most deadly type of forklift accident according to the CDC. Forklift tip-overs are caused by workers driving too fast, turning around corners too fast, carrying too heavy loads, accessing a ramp wrong, and carrying an unbalanced load. In addition to tip over accidents, serious injuries and fatalities caused by being crushed under a fallen forklift are another top accident. OSHA has created a regulation requiring that all industrial machines manufactured after 1992 be equipped with seat belts and other restraints. While OSHA does not have a law that specifically requires seat belt use, they do require that employers provide a safe working environment for workers free of recognized hazards, and enforcing seat belt use to prevent tip-over accidents is included in this regulation. Why would a forklift tip over? Some of the main causes include traveling too fast, unbalanced cargo loads, and transporting heavy weight up or down a slope. Tip-overs can happen. Be prepared by always wearing your forklift seat belt. It’s simply the smart thing to do! The main reason why workers die from forklift tip-overs is that they fall from or attempt to jump from the tipping forklift and aren’t wearing a seat belt. When a worker is caught underneath a forklift, the weight of the machine can liquefy or splinter a limb and render it inoperable at best, or fatally crush the work at worst. To avoid a tip over, stay at a safe speed, keep your lift’s max load capacity in mind, avoid obvious terrain hazards, and use caution when navigating slopes, turns, and other dangerous areas. Despite the most careful safety precautions, forklift tip-overs happen. And if you’re secured with a forklift seat belt, there’s less of a chance you’ll be hurt. The safest place for an operator is strapped into the seat of the forklift with the seat belt fastened. The purpose of the forklift seat belt is to rob the operator of their most instinctual reaction; to jump away from the tipping forklift. Workers panic when they’re inside a tipping forklift and believe they are better off trying to get away from it. But it is difficult to jump away far enough and manage to jump straight through the opening of the doorway around the cage and seat. In addition to causing more serious injuries and fatalities, the lack of enforcement of seat belt use can lead to thousands of dollars in OSHA fines. Tip-overs are one of the most common accidents involving forklifts and often lead to serious injuries and fatalities. However, they are preventable with safety tools like seat belts and proper forklift certification training from reputable online schools like ForkliftCertification.com. FLC is here to help with all of your training needs. Our three training packages provide an in-depth review of important OSHA standards, including forklift seat belt laws. Get your OSHA forklift training today! For questions about our training modules, or if you’d like to learn more about our online courses, give us a call at (888) 278-8896. This post was originally published in 2017 and updated to provide more information in 2018.